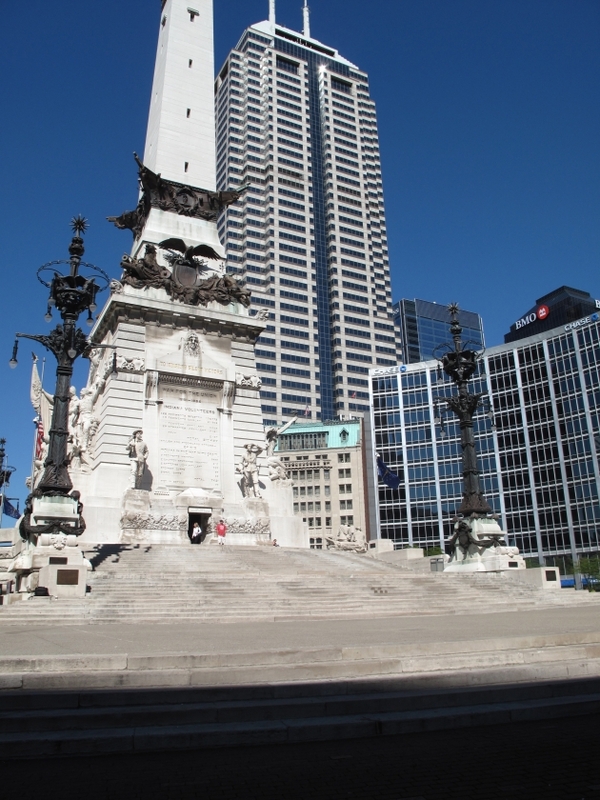 If you walk out of the Starbucks on Monument Circle, at the center of downtown Indianapolis, Indiana and cast your gaze to the east toward the City Market what you’ll see the ubiquitous street scene. The details are made up of “pedestrians”, automobiles and trucks looking for parking spaces, a jumble of street lights, store fronts, awnings, signs, and Jimmy John bike delivery folks. Following your view you’ll see, in the distance, the raised highway connecting us, by car or bus, to every other city with similar details making up similar visual clusters found on their streets. In the instant that it takes your eyes to travel from the dried gum on the sidewalk walk in front of you to the tops of cars speeding wildly toward the south split your eyes will have passed over where I grew up. Well, at least where I spent 18 significant-growing-up-months wedged between high school and college. In 1976-77 I was the kitchen manager for a freshly opened and fancy restaurant called J. Pierpont’s. It was put into the middle of that first block of Market on the north side of the street. The place we inhabited with our love of downtown and adventure was the Fidelity Trust Building at 148 East Market Street. (Literally a stone’s throw from the Circle.) The building was built by Indy Architects Rubush and Hunter. It’s on the National Register of Historic Places as are a number of their Indy buildings: the Circle Theatre, Public School #66, and Madame C.J. Walker Building to name a few. This building is now occupied by Bu Da Lounge, “The first Asian-inspired cigar-martini lounge”. The J. Pierpont’s massive bar, which I watched them build, is still in use at Bu Da. Back in the seventies the idea was to be the first to do something really cool downtown and bring people in from the outlying areas. It was a work in process and it worked – for a while. I doubt few of you reading this showed up to eat my roasted chicken and mandarine orange omelette, or my burned-to-a-crisp peppercorn steak, or a piece of one of my insanely conceived quiches that sold out each night. I was barely more than a kid working in the abandoned downtown called “India-no-place” with phenomenal owners, managers, waiters, bus people, dishwashers, and patrons. I was given artistic freedom to invent the new. My methods grew out of need and came from hands-on research. Each night, several times a night, one of the waiters would come back to me with an order ticket that was filled with a run-on paragraph of a sentence describing a special order. I’d look at the dissertation and then I’d look up at the waiter. Our eyes would meet. He’d say, “These are my regulars and I’d like to take care of them.” I’d smile. He’d intuit my willingness to engage in steep learning curves and we’d dive in together. At first, the different waiters would have to walk me through the whole thing. Sometimes they had to come around the counter and make it themselves. But once I got up to speed I’d be able to decipher the chicken scratch on the tickets without any assistance. Eventually a quarter of the orders were made to order. I started adding twists to the one-of-a-kind dishes I was making and this eventually led to changes in the evolving menu. It wasn’t until years later that I realized that these waiters were sharing recipes that each of them carried with them from their own kitchen experiences and family traditions. Unnamed and untraced traditions I unknowingly picked up and altered as I saw fit. The kitchen was a pressure cooker. Everything, every night, was at stake for all of us. We were there to make enough to pay our own bills. But we truly showed up every evening to be part of inventing a place that mattered using food as a shared language. It seemed pretty simple – we were trying to figure out what people wanted. And we did this by listening carefully to the the folks that came into our restaurant and by remembering our own culinary experiences. None of our patrons ever knew they were pumping loads of taste-related data into that smoky kitchen. Data that acted as a democratic flow of provocations for our best food ideas. The backdoor of the kitchen opened out onto the alley framed by the turn-of-the century brick firehouse and Bash’s Seeds on Delaware. I didn’t know a daytime downtown. I’d show up for work with the sun low in the sky and went home about three every morning. It was the deserted, twilight and nighttime Indianapolis that my imagination absorbed. On my breaks I’d wonder downtown, peek in the store windows, gaze up at the office lights where crews of night custodians put working worlds back together and made them ready for the next day. I was out looking for visual poetry – the accidental treasure left suspended until the next day. The businesses were locked up and encased in glass. Each of them a virtual gallery of commonplace human decisions. Here were the thank you notes on secretary desks, the picts of family, the seemingly out of place poster declaring the owner’s passion for one country or another, one sport or another, one sunset or another. Monument Circle was quiet, hush quiet, back then. But I’d walk half a block over just to look up at it, go over the faces on the statues, and count the cars. I couldn’t figure out how I had become a stranger to downtown? Why hadn’t I been coming down here my whole life? The place didn’t seem like a no place to me at all. But I didn’t have the words for it and there weren’t any blog posts coaxing out the significance of the urban experience in the 1970s. But what was happening to me was timeless – I was finding my own way to be part of something bigger than I that was being made in real time. And my being part of it changed me and gave me a sense of vision as to the world I wanted to live in – and some insight into the practical layout of how a place is made and remade. Relationships make the place. All relationships depend upon a shared and evolving language. And all relationships require people to take turns. Who is going to do what next? And, how will I respond when it is my turn next? It’s pretty simple and it’s not the sort of thing you want to wait too long before you decide.